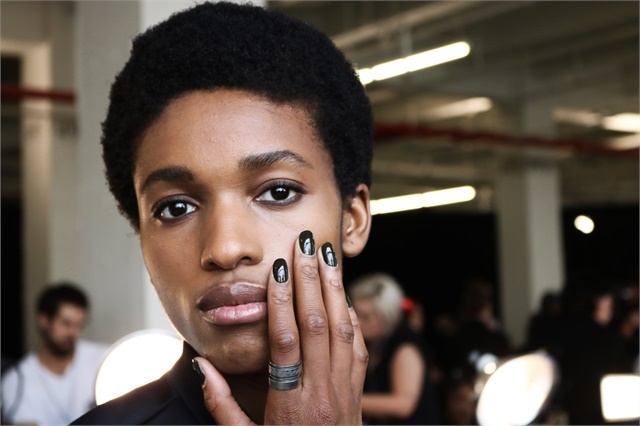 Jin Soon Choi created negative space moon nail art manis for the Tibi Fall/Winter 2018 collection, which took inspiration from the elements of city construction sites. The nail design follows the natural, traditional lines of the nails before they take an unexpected turn into work of art, creating a look that allows onlookers to find the beauty in a work in progress. 1. Shape the nails and clean any residue from the nail bed. 2. Apply JINsoon Power Coat base coat. 3. Using a striping brush, dip into the main color and paint a curved line under the "moon" of the nail (u-shape). 4. Use the polish brush to fill in the area below the curved line. Repeat steps 3 and 4 on four nails per hand, leaving one nail blank on each hand. 5. The two blank nails will be accent nails. Using the bright color follow steps 3 and 4 to create a moon shape using the bright color. 6. Finish the look with JINsoon Top Gloss top coat. The Derek Lam Fall/Winter 2018 collection was inspired by traditional men’s English fabrics and equestrian silhouettes, paying reverence to English history. Jin Soon Choi's nails feature a modest yet high shine nail look that coincides with the silk textures and color variation within the collection, channeling the modest class of the archetypal equestrian. She used JINsoon in Muse to create this look. The Phillip Lim Fall/Winter 2018 collection was inspired by '80s Versace, with mixed Roman prints and earth tones coinciding with colors ranging from pastels to dark blues and black. The nail look features smoky earth tones to complement the textures and shade range the collection's aesthetic portrays. JINsoon in Austere, Baroque, Dulcet, and and Charade were used for these looks.